Every month no matter how many commissions are on my plate I make sure to make time for Draw A Dot.’s illustration open call. It’s always important to make time for your own artwork. I can’t recall how many times I’ve heard art directors and agents say that they look for artists who are passionate enough about their work that they create in their free time. Many times it’s during a personal project that artists tend to grow and evolve their style. Marcus Kan, the brains behind Draw A Dot., happens to be the art director and creator of several popular art blogs and sites online, including Fusion of Effects. Through Draw A Dot. he features artists with a surreal illustration style that tell a story through their artwork. When I first started entering his open calls, my work was admittedly less interesting with much less interaction with composition and story line. I’m so happy to be part of an illustration community that pushes my style as an illustrator and challenges the way I see fashion as subject matter. This month the open call was based on the Miu Miu Spring 2017 line, full of vintage pin-up beachy vibes. 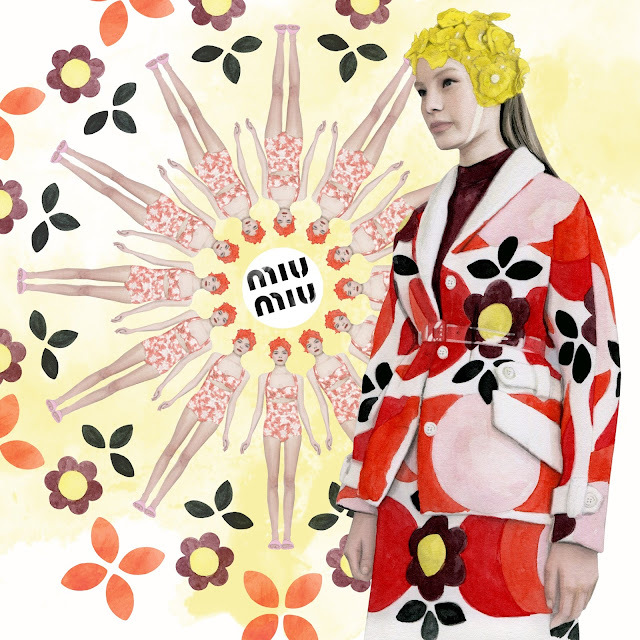 The psychedelic reference to the 60’s and 70’s in the form of fit-and-flare coats paired with floral swim caps created such as interesting basis for fashion illustration. I could not have had more fun creating my own punchy print made of synchronized swimmers donning my favorite swimsuit mixed with components from the actual prints from the line. Today Marcus will start posting his nine favorite illustrations from the open call on Draw A Dot.’s Instagram and I encourage you all to follow along and hopefully find a few new exciting artists to follow.